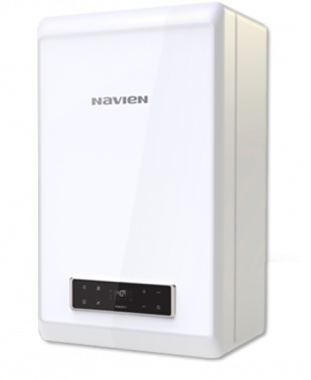 Designed and manufactured by Navien, the NCB 20kW is a gas-fired, condensing System boiler that comes wall-mounted to help save space around the home. A high seasonal efficiency rating of 92% make this an ErP A rated boiler for heat and will help to save you money on your energy bills. An output rating of 20kW makes this an ideal boiler for small homes, with 1 bathroom, that don’t have such a high demand for heating and hot water. The NCB range of System boilers includes higher output ratings too, including a 23kW boiler which is also good for smaller homes, a 28kW unit for medium-sized homes and a 33kW output for larger homes with 2 or more bathrooms. Combi boilers, as well as System boilers are also available. Navien’s range of NCB System boilers come with a primary and secondary stainless steel heat exchanger, which helps to prevent corrosion and erosion for an extended life and being OpenTherm ready means that it delivers the latest technology to help cut the costs of installation. More features of this boiler include a full-modulation system that continuously optimises its heat output, extended venting up to 20m for flexible installation, optional outdoor weather sensor, a self-diagnosis and error feedback feature, for quick troubleshooting, and a stylish touch-type control panel for complete control over. Plus, the NCB 23kW is able to regulate the heating temperature according to changes in outside temperatures. As a System boiler, this unit sends hot water to the radiators and a sealed hot water storage cylinder and all of the important parts are built into the unit itself, making it compact and easy to service. NCB System boilers come with a 7 year warranty, to give you the peace of mind that you’re investing in a reliable boiler.